Answer: Maybe. 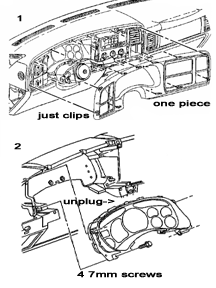 Removing the instrument cluster is a simple procedure. But working on the internal mechanics of the unit is a process that carries a much higher degree of difficulty. Most Do-It-Yourselvers will not have adequate tools or workbench equipment to perform a proper repair. Replacing the stepper motors requires removal of gauge needles. The needle shaft is very delicate and easily bent or broken if improperly handled. Recalibrating the gauges correctly after the repair also requires a high level of proficiency. The majority of car owners would be better off letting a professional handle the repair. Can’t I just buy a new cluster? Answer: Absolutely. But it gets expensive quickly. Anticipate spending anywhere from $300 to $900 for the new cluster at a dealership with little guarantee that the replacement doesn’t have the same faulty motor. In addition, the odometer will have to be reset to the correct mileage for your vehicle. What Does a Stepper Motor look like? Chevy Monte Carlo, Buick LeSabre, Buick LaCrosse, Pontiac Bonneville, Sunfire, Cavalier. We Take Cashiers Check, Money Order, PayPal and Good Old Cash. If you need to use a Credit Card and don't have a Paypal account let us know and we will email you a Paypal invoice. From there you will be able to use a credit card of your choice. Sorry, but Prospeedo does not offer any mobile services. All work is being carried in house only. Office Hours are 10 Am to 4 Pm Monday through Friday. Saturdays and Sundays by appointment only. Can’t I swap my instrument cluster stepper motors with one from a salvage yard or junk yard? Answer: Yes. However, the used cluster has the same faulty stepper motors that are causing the problem with your current cluster. Ultimately, the motors in the used cluster will fail and you’ll be back in the very same place you started. In addition, most instrument panels are specific to the vehicle. Pulling an used cluster (even from the same year, make, and model) may result in a loss of functionality such as the steering wheel controls no longer working. You will also need to reset the odometer to match the information like Vin # and Vehicle Option list etc. This Information is stored within the cluster, and must match the vehicle you are working on. 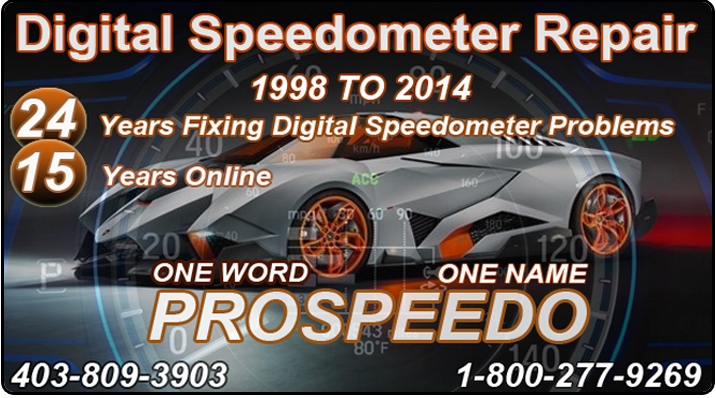 Prospeedo.com is the Worlds Largest Online Speedometer Repair Shop.They have Over 24 years in the Digital Speedometer industry. What’s the turnaround time for the repair? At Prospeedo you can wait for it while you have a Coffee or send it in and it will go out the same day as we receive it. Do they offer a warranty or guarantee on the repair? Prospeedo offers a one year warranty on anything they repair. Do they show the client what was replaced and why? Prospeedo does not believe a Speedometer Repair should be hidden behind closed doors. Do they replace the illumination lamps if some are burnt out? Prospeedo will bench test all Digital Speedometer Clusters right in front of you, so you can see with your own eyes what works and what needs to be fixed. Prospeedo Charges $10 USD to replace each burnt out light bulb and $50 USD for every new Stepper motor we use on your circuit board. We are now offering a $200 USD Special which includes all defective Stepper motors replaced as well as any burnt out illumination bulbs. If You are sick and tired of looking at your broken speedometer in your 2003 to 2006 GMC, Chevrolet, Hummer Vehicle and have 20 minutes to spare we will be happy to help you.Please Note! The $200 Special price is for local drop off and pick up only! All Speedometer Clusters must be loose and already removed from the vehicle. For any GMC Speedometer Clusters that are being sent in to us by mail or other delivery carriers the cost will be $285 USD. Price includes return shipping back to you. How much to program the original Mileage back into the cluster? Prices start at $285 USD and can go up to $1,500 USD depending on what it is. Gauges not working? fuel gauge, gas gauge not working, temp gauge not working, oil gauge not working, speedometer gauge not working, rpm gauge not working, PRND321 not working? All gauges not working? We can Help! The common cause for all these issues is a faulty stepper motor. The motor was used throughout GM’s entire production line from 2003 to 2007. For those with a technical bent, this includes the GMT800, K20, GM360, and GMX380 platforms. How common is the GM Speedometer Gauge issue? 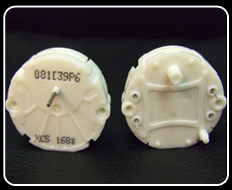 Answer: The stepper motor at the heart of the issue was used throughout the GM line from 2003 until 2007. Our rough estimate is that this problem affects roughly 4 million cars and trucks. Answer: See picture below. Removal of the cluster is a straight forward process that shouldn’t take more than a few minutes.The removal process is roughly the same for all 2003 to 2006 GM models. 3. Tilt the steering wheel to the full down position. You do not need to remove the steering wheel as seen in the image - "Picture 1"Top. 4. Pull gently rearward on the corners of the bezel from the instrument panel assembly. There are no screws holding in place. See "Picture 1"Top. 6. Remove the four (7mm hex head) screws that retain the Instrument Panel Cluster. See "Picture 2"Top. 7. Remove the Speedometer Cluster from the vehicle by tilting the bottom of the cluster outward. 8. Disconnect the Speedometer harness (2) by squezing in it's Blue top and bottom clamp tab and pulling moderately. Please Note! your original Mileage stored in the cluster has nothing to do with replacing Motors or lights in your Instrument Cluster. It will always stay the same. Yes! If the original miles need to be put back on this will not be a problem. Prospeedo can Program 98% of all Digital Instrument Clusters you see on the market today. See Disclaimer Form below. Please Note! You must read, print and sign our Disclaimer Form before any work will be performed. Disclaimer form must be sent back with your package. How long does it take to fix my Speedometer? Canada Alberta Speedometer Repair Pros!